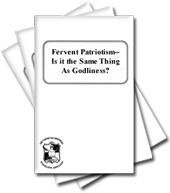 Fervent Patriotism - Is it the Same Thing As Godliness? Divine healing is a miracle which God in His mercy and love may extend to those who call upon Him in time of need, according to faith and/or other factors. Christians are encouraged to appreciate this special benefit from God as well as to do everything they can for themselves in times of illness or injury by seeking the most competent professional help. Faith in God for healing does not conflict with the use of modern medical science. The healings of Jesus Christ demonstrate and represent His power to express compassion, to forgive sin, and ultimately, to resurrect the dead and establish the Kingdom of God on earth. Healing is a continuous theme running through the Bible from Genesis to Revelation. Yet it cannot be denied that God has extended the miracle of healing in different degrees for different purposes at different times. People have not always been healed with the same regularity or for the same reason. There are few healings recorded in the Old Testament. The very fact that God gave laws of quarantine to ancient Israel proves that He did not instantly heal every disease, even in His theocratic state. During Jesus' time, and during the apostles' early ministry, God poured out the gift of healing much more than He ever had previously or has since. Jesus' miracles of healing also helped establish His absolute credibility as one sent from God. It built faith into those who saw His healings firsthand and into all who read of them millennia later. Healing was also utilized for expressing Christ's power on earth and for attracting public awareness quickly for the preaching of the gospel. It is quite evident that God is not healing today in the same manner or to the same degree that He did in early New Testament times. It is equally evident that the physiological knowledge and medical expertise of the end of the 20th century is far advanced over that of the middle of the first century (and certainly unrelated to the magical rites and potions of even earlier centuries). Consequently, Christians today can take full advantage of the latest information in health maintenance and the most modern techniques in health care, recognizing that such proper physical concern in no way detracts from one's faith in God. Healing may assume various forms in the Bible. The actual biblical usage of the English word "heal" (and the Hebrew and Greek words from which it is translated) is quite broad. It can mean the healing of the body, but is not limited to the physical body; it can refer to the healing of the mind or the emotions (Psa. 147:3); it can have the metaphorical connotation of the healing of the land (2 Chron. 7:14), God's people as a whole (Jer. 6:14; 8:11), the nation of Israel (Lam. 2:13; Hos. 7:1), and gentile nations such as Egypt (Isa. 19:22) and Babylon (Jer. 51:9); it can refer to the healing of inanimate things such as the earth (Psa. 60:2), water (2 Kings 2:21; Ezek. 47:8, 9), and even the "altar of the Lord that was broken down" (1 Kings 18:30, where exactly the same Hebrew word that is usually translated "healed" is translated "repaired"); it can allude to abstract concepts such as the healing of faithlessness or backsliding (Jer. 3:22; Hos. 14:4); it can also be used of spiritual healing, the healing of the " sin-sick soul," as it were (Psa. 41:4; 2 Chronicles. 7:13, 14; Isa. 57:19; Matthew 13:15; Acts 28:27). Of course most of the places where the term "heal" is used in the Bible do refer to the miraculous, though physically oriented, healing of an ill or injured human body. In Exodus 15:26, where God states "..... I am the Lord, your healer," the Hebrew word translated "healer" is rafa. It is exactly the same word used in Genesis 50:2, which refers to Joseph's "servants the healers." Note that the "physicians" or "healers" are not condemned, but are specifically called Joseph's servants. "When men quarrel and one strikes the other with a stone or with his fist and the man does not die but keeps his bed, then if the man rises again and walks abroad with his staff, he that struck him shall be clear; only he shall pay for the loss of his time, and shall have him thoroughly healed." "And King Joram returned to be healed in Jezreel of the wounds which the Syrians had given him at Ramah." Again, healing (rafa' is used in reference to what men can do for themselves. The contrast of "a time to heal" with "a time to kill" in Ecclesiastes 3:3 strongly suggests a natural healing process. There are two scriptures that indicate, although their usage is certainly metaphorical, that the term "healing" can be used to describe the natural bodily processes that can be aided by external medicines. In Jeremiah 51:8, balm is suggested as a possible way for Babylon to be healed ("give her medicine; perhaps she can yet be healed"Living Bible); in Jeremiah 30:13, the lack of medicine is equated with the consequent lack of healing. From God's statement to Ezekiel showing that Pharaoh's broken arm was not healed because it was not bound up with a bandage (Ezekiel 30:21), it logically follows that the arm would have "healed" had Pharaoh in fact bound it up. This confirms that the biblical usage of "healing" can include the physical body's normal mechanisms of recuperation and repair as part of its overall definition. In the New Testament there are three Greek words translated "heal" in the King James version: therapeuo, meaning "to heal" in the New Testament, and "to care for, wait upon, treat (medically), heal or restore" in Greek literature outside the New Testament; iaomi, meaning "to heal, cure or deliver"; and sozo, meaning "to save from death, to free from disease, to make whole, to save from eternal death, or to attain salvation. " Sozo is especially interesting in that, while it is clearly used to describe physical healing in Mark 5:23; Luke 8:36 and Acts 14:9, it is the same word appearing about 100 times in the New Testament to describe the process of spiritual salvation (suggesting some conceptual relationships between healing and salvation that will be discussed in the section on The Healings of Jesus Christ). The miracle of healing is an act of God's divine grace, which must not be taken lightly. It is therefore important that one understand the topic of healing in the context of the entire Bible. If one approaches the scriptural references to healing without the full biblical context, and out of the context of human experience, he may fix upon them a meaning not supported by logic, common sense or proper biblical exegesis. In this regard, we should consider some important scriptures. Notice that the promise is conditional; it is predicated on obedience. God also says that He will refrain from putting diseases upon the nation. "You shall serve the Lord your God, and I will bless your bread and your water, and I will take sickness away from the midst of you. None shall cast her young or be barren in your land; I will fulfill the number of your days." The converse of these blessings promised for obedience are the curses pronounced for disobedience. Instead of removing sickness and disease, God would allow these afflictionsalong with many other cursesas the natural consequences of man's ways apart from the ways of God. Deuteronomy 28 enumerates these curses in great detail (see especially verses 21, 22, 27, 28, 35, 59-61). The promises are conditional. Blessings come only with obedience; curses automatically follow transgression. But notice that these promises are national rather than individual. Sickness would be removed from the nation to the same extent that barrenness, miscarriages and premature death were taken away. Healing as such is not really promised in these verses except as it is implied in a general way in the promise to remove sickness. Healing in the Bible is not a simplistic algebraic equation relating faith and healing. God healed for different reasons in different circumstances. God healed Abimelech and his household after Abraham prayed for them, (Gen. 20:17), thus ratifying Abraham's position as a servant of the Eternal. God healed Hezekiah from a deadly sickness and added 15 years to his life because He respected Hezekiah's heartfelt prayer in which he recounted to God, with tears, his utter loyalty, sincerity and uprightness. The story of Elisha is similar, yet it has a "twist" ending. Elisha was a remarkable individual (2 Kings 2:9). He asked for and received a double portion of Elijah's spirit. A great number of miracles are recorded in his name; even after his death, Elisha's bones brought a man back to life (2 Kings 13:2 1). Yet Elisha died of a sickness (verse 14). Despite the great powers bestowed and miracles performed through God's spirit, Elisha himself was not healed of some sort of sickness but actually died from it. A strong statement about healing is found in Psalm 103:3-. "who (God) forgives all your iniquity, who heals all your diseases." Surely God has stated that He desires to, can, and shall heal; but nowhere has God absolutely bound Himself to provide physical healing, nor is this passage an exception to the statement. The context of the psalm is given in verse 2: "Bless the Lord, 0 my soul; . . . and forget not all his benefits." The psalm is essentially a recitation of the many benefits received from God. However, these various benefitsof which physical healing is indeed oneare not absolute and unconditional promises to which God has irrevocably bound Himself. Notice that one's youth is renewed like that of an eagle (v.5) and God provides justice for all the oppressed (v.6). These are both promises in only a general sense since various qualifications are indicated elsewhere in scripture. Our youth is not always renewed like that of an eagle. There have been countless righteous people oppressed without receiving justice. Verse 3 is no more a blanket promise for unconditional physical healing than any of the other promises in the psalm, as other scriptures and the experiences of the Church show. Yet the power of the poetry cannot help but make one realize that our God does desire to heal our diseases, to eliminate our afflictions, and to bring us out of distress. But what He will actually do in any given situation remains unknowably beyond our limited understanding. Several examples of non-healing are also recorded in the New Testament, even during a period when special gifts were possessed by some and astounding healings were being performed by various of the apostles. Paul writes that Epaphroditus was very ill, almost to the point of death (Phil. 2:25-27). But God had mercy on him. Healing was here given as an example of mercy, not of faith or obligation (or at least not of these alone). On another occasion, Paul mentions that he had left Trophimus ill in Miletus (2 Tim. 4:20). He does not elaborate on the situation, but illness is taken as a matter of course rather than as some sort of unexpected occurrence. In fact, in an earlier letter to Timothy, the apostle Paul refers to Timothy's "frequent ailments" (1 Tim. 5:23). Paul himself had a "thorn in the flesh" (2 Cor. 12:7ff). He does not describe it exactly, but there is a likelihood that it was something physical. The Greek term astheneia, translated "weakness" in verses 9 and 10, is often used specifically of physical weakness, sickness or disease (e.g. Acts 5:15; 28:9; Luke 5:15; John 5:5). If Paul's "thorn" was indeed some physical defect, he was suffering from the very thinga physical weaknesshe was being used to heal others of. At first glance, James 5:14-20 seems to contradict the biblical fact that God's promise to heal is conditional rather than absolute. James says that the "prayer of faith on behalf of a sick person who has requested and receives the anointing of the ministry shall save the sick, and the Lord shall raise him up." But to interpret James' statement to mean that the prayer of faith must always obligate God to physically heal not only contradicts numerous biblical and Church examples of healing and non-healing, but is also unfair to the sense and context of these verses. Although this one statement appears to be written without qualification, the condition, "if it be God's will," was no doubt tacitly understood. Furthermore, the word translated "save" in verse 15 is the Greek word sozo. As previously explained, sozo is used only a few times in the Bible in reference to a sick person being made well (e.g. Mark 6:56). The overwhelming majority of times (over 100) that this word is used in the New Testament it is in the spiritual sense of eternal salvation. Likewise, the word "raise" in this verse, egeiro in Greek, can mean "to rouse from sleep or lift up as from a bed or floor"; but egeiro is used most often in the New Testament to represent the resurrection from the dead. (Examples of this usage are found in Matthew 10:8, where the disciples are instructed to "raise the dead, cast out devils"; Matthew 11:5, "the dead are raised up"; Matthew 14:2,"he is risen from the dead"; Matthew 16:21, "and be raised again the third day"; Acts 3:15, "whom God hath raised from the dead"; and Romans 6:4, "as Christ was raised up from the dead.") Thus, while James is primarily speaking of physical healing upon anointing by the elders, he is also alluding to spiritual salvation and the resurrection from the dead. The ambiguity caused by the double meaning of these words no doubt has a purpose. It may have been James' intent to show that God will probably heal the faithful sick person, but certainly shall grant him salvation through the resurrection. James thereby confirms the conditional nature of the promise of physical healing and the unconditional nature of the promise of the resurrection from the dead. It is true that the Bible often condemns ancient practitioners who relied on pagan gods, amulets, incantations or other forms of magic. But one cannot extrapolate from ancient superstition, demonology and ignorance to modern scientific medicine. In biblical times the medical arts, primitive by today's standards, were often associated with pagan religions and mystical rites: the line between such "black arts" and pure medicine was hazy. Now Ahaziah fell through the lattice in his upper chamber in Samaria, and lay sick; so he sent messengers, telling them, "Go, inquire of Baalzebub, the god of Ekron, whether I shall recover from this sickness." This passage does not mean that Ahaziah went to Baalzebub for healing. Firstly, if he had wanted to be healed, he would have gone personally rather than just sending messengers. Secondly, he was only trying to inquire whether he would live or die, nothing more. This implies that he was consulting an oracle to try to find out the future, disobeying God's law in the process, just as Saul had done before his final battle with the Philistines. Professor John Gray in his commentary on Kings states: "daras (literally 'to seek') is used specifically of seeking divine revelation by consulting an oracle, cf. Amos 5:5." Ahaziah should have sought to God concerning his futuretherein lay his mistake. There are a number of other biblical allusions to physicians, healing and medicine. Exodus 21:19, as discussed above, hints at the beneficial, fully accepted use of "healing arts" within Israel; Isaiah 38:21 gives an example remedy for boils which Isaiah himself prescribed. Perhaps it could be said that this "cake of figs" which Isaiah had said was to be applied to Hezekiah's boil "that he may recover" was only symbolic since God was going to supernaturally heal Hezekiah. Yet the fact remains that Isaiah did state that such an external, physical healing-type medicine was to be applied. Such "medical" help (within the medical technology of the time) was not only not condemned but was actually a fundamental component of the healing process. It certainly would appear that this laudable example of Hezekiah's beseeching with full faith in God for healing did not exclude his simultaneous utilization of external "medical" aids. In fact by requiring it as part of the process, Isaiah corroborates the view that man should do the most that he can for himself, while asking God to do that which he cannot. Other references to physicians are used metaphorically. Jeremiah 8:22 certainly gives no sense of condemnation; many, in fact, read it very positively regarding its allusion to the role of a physician: "Is there no balm in Gilead? Is there no physician there? Why then has the health of the daughter of my people not been restored?" Job 13.4 does not refer to all physicians. In 2 Chronicles 16:12, Asa is censured for not seeking God for help in his illness; the questions of whether the act of seeking the physicians was itself condemned in this case or whether these "physicians" were really priests and magicians of a false religion (and thus to be condemned) cannot be settled here alone, considering the lack of biblical data. In any event, the primary point of the verse is clearly that Asa erred in consulting only physicians, and did not consult God at all. What about medicines and drugs? Revelation 21:8 says that sorcerers (Greek pharmakos) shall have their part in the lake of fire. The clear evidence indicates that the word pharmakia referred to cult worship and the use of drugs to induce spells, rather than modern medicines and pharmacological drugs since these were not then in existence. Medicines used to heal sickness are not condemned in the Bible. Passages alluding to the use of medicines or similar preparations for healing purposes (e.g. Is. 38:21; Prov. 17:22) do not condemn them. As seen above, the metaphors in Jeremiah 30:13, 51:8 and Ezekiel 30-21 alluding to the use of healing medicines or physical methods of healing may either be stated sarcastically or as an accusation, but the allusion is nonetheless positive as far as the benefits of the medicines are concerned. The words used in these scriptures are derived from rafa' and evidently have the meaning "that which heals." Ezekiel 47:12 is especially interesting since it shows the continuing positive use of healing medicinesmade from special leaves from trees which are nourished by waters from the new Templein the millennium after the return of Jesus Christ. Corroboration can be found in Revelation 22:2, where it relates that healing preparations shall still be used after the new heaven and new earth are established. Whatever the understanding or fashion of usage (literal and/or metaphoric)which is presently well beyond our ken [perception; understanding] even the reference to these healing preparations must surely be taken as a very positive sign since they shall have their part in this magnificent environment. God's earnest desire is for all human beings to live an abundant life in perfect health. This attitude is reflected in the words of the apostle John: "Beloved, I wish above all things that thou mayest prosper and be in health, even as thy soul prospereth" (3 John 2). The Bible refers to health as a positive standard metaphor with which other things are likened ("the tongue of the wise" in Prov. 12:18 "a faithful ambassador" in Prov. 13:17, "pleasant words" in Prov. 16:24). To this end, the Bible gives basic principles of health which, counted with common sense, experience and modern knowledge, would prevent many of the health problems plaguing modern man. Common sense and experience by themselves should make the basic principles of health quickly available to everybody. The old adage "an ounce of prevention is worth a pound of cure" is absolutely valid. The realization of this should lead to an attitude of genuine care and concern for the health of one's family and oneself. Such a conscious awareness would go a long way toward securing good health. A vital component of a good health program is a balanced diet which includes wholesome, natural foods and which excludes (as much as is practical in our society) processed foods such as sugars and starches, and artificially flavored and preserved foods. The right amounts of exercise, sleep and relaxation are likewise important. Maintaining a positive mental outlook and a peaceful mental attitude by eliminating (or at least attenuating) stress and flares of emotion is being increasingly recognized by modern health specialists as an essential health principle, considering the enormous effects (called "psychosomatic") that the mind exerts on the body. Caution should, of course, be taken to prevent accidents and bodily harm (without becoming obsessive or paranoid in the process.) Finally, a regular program of routine physical examinations by a qualified doctor is also important in recognizing and solving any potential problems before they become serious. God has designed the human body to function in good health for the full span of one's allotted years. Unfortunately, mankind has so polluted the environment and human beings so often ignore the basic rudiments of health that imbalances occur, with sickness and disease the natural result. To the degree that a person disregards the obvious physical principles of health, such as proper nutrition, adequate sleep and rest, a positive mental outlook, etc., is generally the degree to which one suffers ill health. The obvious exceptions to this are accidents and when disease or affliction is inherited. Even these two cases are many times the result of mankind harming himself, however, because most accidents are the result of carelessness and could have been avoided, and many inherited illnesses no doubt result from the nutritional, environmental, or even medical shortcomings of previous generations. Some obvious examples are the limb less offspring of mothers who ingested the drug thalidomide during pregnancy; the children who are born deaf because their mothers had a disease during pregnancy; and those who have organic brain deficiencies due to malnutrition. It is evident, then, that most of man's health problems are self-generated. Radiant health has always been a prime concern of the Church. Indeed, the Church strongly teaches that individuals must care for their bodies physically, just as they must care for their minds mentally and spiritually. For, in the final analysis, physical, mental, and spiritual health cannot be isolated from one another. Even though physical life is not the primary object of Christian commitment, it is important, and God expects us to take care of our bodies. Consistent with this is making good use of available knowledge about the human body, its functions and processes. In addition to showing how to maintain good health, specialists can aid the body in time of injury or bad health. This human aid in no way hinders God if He decides to intervene miraculously and do what cannot be done physically. No matter how much we take care of ourselves, almost all of us become ill or sick from time to time or suffer a misfortune such as an accident. At such times, the biblical record makes plain that God can intervene on behalf of the sick and heal them according to faith and/or other factors. This divine healing process is apart from, and not in conflict with, anything a person can do to help himself. Healing is a "special benefit" which God has made available to His Church. But it is not part of His spiritual, moral law, as it were; and not being healed, therefore, is not a sin. The ill individual should look to man for whatever physical help he can receive but should also look to God to do what man cannot dosupernaturally intervene and divinely remove the illness, sickness or disease. The basic instructions followed by the Church are found in James 5:14 ff. These verses state that the sick person should call for the elders of the Church who will lay hands upon his head, pray over him and anoint him with oil. This ceremony is richly symbolic: the oil is a symbol of God's Holy Spirit (cf. Ex. 30:23-25; Matthew 25:lff; etc. ); the act of one having hands laid upon him shows the person's desire to be set apart by God through His Spirit for the special miracle of the divine healing of his body. Physical sickness and illness can be caused by different factors. At times, it is the general result of violating the principles of health, or perhaps the direct result of a person's own sin (Matthew 9:1-7; John 5:14). At other times, sin is not involved; and the illness or infirmity is inherited (John 9:2) or the result of injury or accident (Luke 13:1-5). Whenever sin is involved, healing includes the forgiveness of that sin (Matthew 9:1-7). The final statement in James 5:14 illustrates the point: "and if he have committed sins, they shall be forgiven him." The construction used (the Greek particle kan with the subjunctive) expresses uncertainty and doubt. The person may have sinned; on the other hand, he may not have sinned. If the individual is only ill, he shall be healed. But if he has also sinned, his sins shall be forgiven as well. It is important to notice that the assumption of sin was made on the part of the disciples. (Job's friends made the same mistakewhich has a definite superstitious ring to itby assuming that Job's physical problems were due to his sins.) Jesus did not say that either the blind man or his parents had sinned. On the contrary, He denied that sin was involved in this case even though He did not elaborate further. The Bible nowhere speaks of "physical sin." Sin is surely discussed a great deal; and from the numerous biblical references, it is possible to piece together the various acts and attitudes which constitute sin. But all of these fall under ethical, moral or mental categoriesand are all, therefore, spiritual in nature. Indeed, the penalty for sineternal death in the lake of fireproves that sin is spiritual only, because "breaking" a physical principle of health (e.g. stubbing one's toe, not getting sufficient vitamin C, ingesting too many refined sugars and starches, etc.) will not lead toward eternal death. Although, as previously explained, much if not most illness is self-generated through ignorance, error or neglect, it is not proper to label such physical mistakes "sin" in the strict biblical sense. Thus, to speak of "physical sin" is an actual contradiction in terms and likely to be confusing. If, however, the illness or injury is directly or indirectly caused by the breaking of one of God's lawstwo obvious examples would be venereal disease, resulting from unlawful sexual behavior, and liver disease, resulting from over-consumption of alcoholic beveragesthen the cause of the problem is indeed sin in its true biblical meaning. It is not always possible, of course, to discern when illness or injury is the result of sin (the breaking of God's law in the letter) and/or stems from a sinful attitude (the breaking of God's law in the spirit). Nor is it wise to become sidetracked by undue concern over whether certain detrimental physical practices under consideration are, or are not, sin. If the physical practice under consideration is indeed detrimentalas determined by biblical revelation or scientific factIt should be stopped, as even common sense would dictate. To be sick, therefore, is not necessarily to have sinned. Sickness is sometimes the result of sin and healing sometimes includes the forgiveness of sin. But at all times, whether sin is involved or not, healing is a manifestation of God's mercy and an exemplification of God's love. Though there were several notable healings in the Old Testament, by far the most important and consistent healings in history were associated with the ministry of Jesus Christ. Some examples (with references) of these healings follow. By both their quality and quantity, they demonstrate the enormous importance that the New Testament places on the healing miracles of Jesus Christ. The leper, Matthew 8:1-4; Mark 1:40-45; Luke 5:12-16; the Paralytic, Matthew 9:1-8; Mark 2:1-12; Luke 5:17-26; the multitudes, Matthew 4:24-25; Mark 3:7-13; Luke 6:17-19; the centurion, Matthew 8:5-13; Luke 7:1-10; Peter's mother-in-law, Matthew 8:14-15; Mark 1:29-31; Luke 4:38-39; Jairus' daughter, Matthew 9:18-26; Mark 5:21-43; Luke 8:40-56, blind men, Matthew 9:27-31; 20:30-34; Mark 10:46-52; Luke 18:35-43; the Canaanite woman, Matthew 15:21-28; Mark 7:24-30; the deaf mute, Mark 7:31-37; the blind man at Bethsaida, Mark 8:22-25; the ten lepers, Luke 117:11-19; Sabbath healings, Matthew 12:10-13; Luke 13:10-17; 14:1-6; the officials sick son, John 4:46-54; the restored ear, Luke 22:50-51. Understanding the significance of all these healings is essential to salvation since they are a direct verification that Jesus of Nazareth is the Christ. Healing was one of the foundational signs that God employed to demonstrate the power and to ratify the office of His Son (Matthew 8:16-17; 11:2-6). Healing was also a fundamental part of the work of Jesus Christ on earth, and of this there can be no doubt. Jesus' primary object in performing the numerous healings that he did throughout His ministry, as it would be recorded in the New Testament for all peoples and for all times, was to give an absolutely certain, physically verifiable demonstration of His spiritual power. The first reference to healing in Matthew's account is in direct association with Jesus "preaching of the gospel of the kingdom of God"; indeed, healing and Christ's message of the coming Kingdom of God were almost inseparable. Many other verses confirm the close interdependence between healing and the full scope of Jesus' gospel of the Kingdom (e.g. Matthew 9:35). The association is profound: healing returns the body to its original, pure, wholly sound state; and so it is with the Kingdom of God, which shall return the earth to its original, pure, wholly sound state (referred to as "the times of restitution of all things" in Acts 3:21). Jesus' power to accomplish the formerthe physical evidence of His healings was immediate and startlingwas the clear demonstration that He likewise had the power to accomplish the latterand establish the Kingdom of God on earth. In this context, Jesus' frequent casting out of demons as part of the healing process foreshadowed His binding of Satan in establishing the Kingdom of God. Jesus' healings were spectacular; no one ever doubted when the crippled walked, the maimed were made whole, the blind saw, the deaf heard. Healings were the clearest demonstration of God's power in Jesus Christ, which could literally flow from Him (Mark 5:30; Luke 6:19; 8:46). Indeed, Jesus' healings represented to the world the absolute power that God had given Him over the world. Healing likewise corroborated Jesus' power over Satan and his demons (Mark 3:15; Acts 10:38). Jesus also used healing to show His authority over other aspects of God's universe, such as, for example, the Sabbath day. When the religious leaders told the man Jesus had just healed that he should not be carrying his pallet on the Sabbath, the man answered them (probably with great confidence and conviction): "The man, who healed me said to me, 'Take up your pallet, and walk'" John 5:11). But the most important aspect of Jesus' spiritual power, that His healing demonstrated to the world was His power to forgive sin, and, ultimately, to resurrect the body from the dead. As noted, the word used in Mark 5:23 to indicate Jesus' physical healing of Jairus' daughter (sozo) is the same word used in about 100 passages to represent spiritual salvation. Jesus' ability to efficaciously heal in the flesh proved His equal ability to assuredly grant salvation in the spirit, thus showing the profound relationship between Jesus' healings and salvation. Many of the people whom Jesus healed were lepers. This dread disease was the epitome of uncleanness. The word "cleanse," utilized in reference to Jesus' healing of lepers (Matthew 8:3; 10:8; 11:5; Mark 1:42; Luke 7:22; 17:14,17) was, interestingly enough, the same word chosen on occasion to describe what should happen to sin and how it should happen. " . . . let us cleanse ourselves from all filthiness of the flesh and spirit" (2 Cor. 7:1); and more directly, "the blood of Jesus his Son cleanses us from all sin" (1 John 1:7). Thus, Jesus' supernatural miracles of literally cleansing lepers in the flesh during His ministry writes the record for all human history and beyond, confirming Jesus as the One who can literally cleanse sinners in the spirit. And just as the faith of the leper and the mercy of God were intrinsic to healing (Luke17:13, 19), so the faith of the sinner and the mercy of God are intrinsic to the forgiveness of sin. Jesus' healing of the paralytic in Matthew 9:1-8 is particularly instructive in exemplifying the relationship between healing and the forgiveness of sin. Rather than healing being the forgiveness of sin, Jesus used His power to heal in order to prove that He also had the power to forgive sin. The miracle of healing (more than any other miracle) was especially apropos since it physically represented a restorative process in which something unclean and broken was supernaturally made clean and whole. Jesus was teaching at home surrounded by a large crowd which had gathered to hear Him. Some friends of a paralytic wanted to bring him to Jesus; they could not get through the crowd so they let him down through a hole in the roof. Jesus saw their faith (not necessarily that of the paralytic, though his was probably included). He said, "Your sins are forgiven" (present tense), or as in Luke's account, "Your sins have been forgiven" (perfect tense). This forgiveness cannot as yet refer to the cause of the man's paralysis even if that cause was sin, since he did not immediately stand uphe continued to lie on his palletwhen Jesus told him that his sins had been forgiven. Only when Jesus realized that He was being judged by some of the religious leaders present, did He demonstrate His power to forgive sins by healing the man "'that you may know that the Son of man has authority on earth to forgive sins'he said to the man who was paralyzed'I say to you, rise, take up your bed and go home"' (Luke 5:24). The point is that the power to forgive sin is proved by the healing"Which is easier to say, 'Your sins are forgiven you,' or to say, 'Rise, and walk'?" Yet, nothing is said about the forgiveness of sin being the cause of the healing. In fact, the verb in Luke 5:20 ("your sins have been forgiven"apheimi) shows that the forgiveness was completed at the moment Jesus spoke those words. But the man was not healed until a few moments later. Thus, the healing was differentiated from the forgiveness of sin. They were two separate acts, with the former being used to prove Jesus' power over the latter. In John 11, Jesus once again gives a physical demonstration of His spiritual power. This time it is His power to resurrect the dead, which is the ultimate miracle of healing. Jesus sets the stage by discussing the subject with Martha, who is grieving for Lazarus; He tells her, "I am the resurrection and the life; he who believes in me, though he die, yet shall he live" (v.25). Jesus then presents tangible proof of His assertionproof that would resound throughout the millennia of historyby resurrecting Lazarus back to physical life. Healing thus foreshadows the resurrection when God shall re-create those who have died and transfigure those who will be alive. Just as Jesus instantly changed sick bodies into healthy bodies, so shall Christ instantly change mortal bodies into immortal bodies. The situations where Jesus actually brought a human corpse back to physical life, as with Lazarus and Jairus' daughter, reinforce the analogous and symbolic relationship between healing and the resurrection. Since physical healing foreshadows the resurrection to spiritual life, the analogy can be extended by viewing sickness as foreshadowing the resurrection to eternal deathand Jesus' power to do the former gives us the ultimate victory over the latter (1 Cor. 15:54-58). Healing, then, is the clearest physical counterpart of this great spiritual event when human mortality shall be swallowed up by godly immortality and when mankind shall be born into God's Family. Though Jesus did not heal everybody all the time, He often responded positively through people's faith in Him. Jesus emphasized that He healed according to an individual's faith. Such an intimate involvement of faith is wholly consistent with healing portraying the cleansing of our sins at conversion and the transformation of our bodies at the resurrectionsince faith is absolutely essential to both processes. It is a person's faith in Jesus Christ, then, that is a critical and necessary elementin healing, in the forgiveness of sin, in conversion, and, ultimately, in the resurrection from the dead. As such, it is completely logical that healing should center around and emanate from Jesus Christ, giving great credence to His office, His authority and His commission. Healing, then, is in essence the physical representation of the spiritual cleansing, restitutory and regenerative power of God through the person of Jesus Christ. This is why healing figured so prominently in the ministry of Jesus Christ and so much less so at earlier times in biblical history, or at later times in church history. The healing of the physical body, radically and miraculously altering it from a state of sickness to a state of health, symbolizes what God can do through Christ to our minds, hearts and spirits. Our sins are forgiven, our minds are changed, our hearts are made pure and our spirits are made whole. The process is supernatural and immediate; just as Jesus could heal the sick and make the lame whole before men, so can Christ cleanse our minds and make our spiritual lives righteous before God. Though healing was a vitally important aspect of Jesus' ministry for what it spiritually represented, Jesus' personal motivation for healing was more simply human. He empathized deeply with the human misery and suffering that illness and injury brought, and consequently did what He could to ease the misery and alleviate the suffering. Jesus was "moved with compassion" (Matthew 14:14) toward people who were sick; He "pitied them" (Living Bible) and "felt deep sympathy" (Modern Language Bible) for them. So, notwithstanding all the other reasons, Jesus healed because He loved people. Or, in more familiar words, he was wounded for our transgressions, he was bruised for our iniquities, the chastisement of our peace was upon him; and with his stripes we are healed." That evening they brought to him many who were possessed with demons; and he cast out the spirits with a word, and healed all who were sick. This was to fulfil what was spoken by the prophet Isaiah, "He took our infirmities and bore our diseases." Furthermore, the Greek word used for healing in 1 Peter 2:24, iaomai, is used almost exclusively in reference to physical healing (yet the context of the verse itself would not exclude a spiritual understanding as well). In giving the Corinthian Church instructions on the proper way to observe the Lord's supper (while correcting their errors), Paul showed how "the wrong manner or attitude toward the body and blood of the Lord (symbolically represented by eating the bread and drinking the wine during the Passover memorial service) has resulted in many Church members remaining weak and ill, with some even having died. Whoever, therefore, eats the bread or drinks the cup of the Lord in an unworthy manner will be guilty of profaning the body and blood of the Lord. Let a man examine himself, and so eat of the bread and drink of the cup. For any one who eats and drinks without discerning the body eats and drinks judgment upon himself. That is why many of you are weak and ill, and some have died (1 Cor. 11:27-30). Paul's precise reference and analysis in verse 30 may be difficult to discern. But what is immediately clear is that physical ills do result from spiritual problems. Some commentators feel that the physical sickness and death were a direct result of the Corinthians' sins in profaning the Lord's supper, or were a judgment from God. There is a variation on this theme, however, which could equally apply. This would involve healingor, more precisely, the absence of it. To investigate this possibility we should consider two simultaneous equations and then solve them together. In the first equation, "the body of the Lord" (vv.27 and 29) which a Christian must discern in order to eat the bread and drink the wine in a worthy manner is the same "body" which Peter (quoting Isaiah) said was wounded so that we could be healed. In the second equation, the profound appreciation of, and personal identification with, the sufferings and sacrifice of Jesus Christ, which are vital elements of the healing Process, are also an important part of the Passover service. What emerges from the two equations is the strong suggestion that it could well have been the lack of physical healing in the Church, caused by a lack of appreciation for the fact that Jesus was wounded for our healing, which was Paul's point to the Corinthians (1 Cor. 11:30)an admonition that should not be lost on the Church of God of any age. In commissioning His disciples, Jesus told them that they too would "heal the sick, raise the dead, cleanse lepers, and cast out "demons" to accompany and corroborate their preaching that "the kingdom of heaven is at hand" (Matthew 10:8). As Luke recorded it: "Whenever you enter a town and they receive you, eat what is set before you; heal the sick in it and say to them, "The kingdom of God has come near to you"' (Luke 10:8-9; cf. 9:2,11). Jesus kept His promise to His disciples. After His resurrection and the sending of the Holy Spirit on the Day of Pentecost, the apostles performed astounding miracles. The healings Jesus Himself performed were utterly miraculous and spectacularmany in full public view. "And great crowds came to him, bringing with them the lame, the maimed, the blind, the dumb, and many others, and they put them at his feet, and he healed them" (Matthew 15:30). Likewise, the apostles performed incredible miraclesmiracles such as the healing of the congenitally lame man by Peter and John at the gate of the Temple (Acts 3:1-11), and the healing of the congenitally crippled man by Paul in Lystra (Acts 14:8-11). In both cases, it was the stunning and incredible aspect of the healingwithered limbs instantly regenerated, strengthened and made wholethat gave the apostles the opportunity to preach the gospel boldly and proclaim it loudly before large, hostile crowds. But as the years went on, it appears that the initial surge of tremendous spiritual power began to wane. In later decades, dedicated Church members are seen sick and dying, and the days of astounding miracles of healing seem to have ended. Paul talks about some in the Church having "the gifts of healing" (1 Cor. 12:9), yet "healers" are mentioned behind apostles, prophets, teachers and workers of miracles in verses 28-30, and verse 10 seems to indicate that those at the higher levels of responsibility in the Church did not necessarily have the gifts of healing. Was the attenuation of major healing miracles the result of a proportional decline in the faith of the elders and members? The answer appears to center more around God's overall, long-term purpose for His Church. At its inception, there was no New Testament record to read and there was great persecution to endure. Consequently, God poured out His spirit to begin the Church and give its members confidence. But it was not part of God's plan for His Church to grow very largethat was not His purpose in that ageso God apparently withdrew His tremendous power to perform spectacular public healings. Coming down the centuries to our time, God's Church has many advantages today that were unavailable in the first century. The mass media of radio, television and publishing enable the gospel to be preached to all the world. The complete New Testament gives us a full account of Jesus' life, teachings and healings, and through God's Spirit, we should be able to study God's Word and develop real spiritual faith without depending on the external crutch of physical evidence through miracles. As far as healings are concerned, we surely know that God is not pouring out His Spirit to empower His ministers to perform breathtaking miracles as obviously and as supernaturally inspired as those that occurred in the early New Testament Church. (Perhaps God will do so at some future date; there are biblical hints and parallels which seem to suggest this possibility as we move closer to the return of Christ.) Does God's Church today have even the same type and frequency of healings that the later New Testament Church had? It is hard to know for sure. But what we can know for sure is the awesome spiritual meaning that Jesus' healings have for us todaythe confidence that they generate, the faith that they give us. We can know for sure that the same Personality who healed the sick, cleansed the lepers and raised the dead has promised, and has the power to forgive our sins, cleanse our bodies and spirits, and eventually resurrect us from the dead. This, in reality, is the ultimate miracle, and this, indeed, is the ultimate faith. 1. Physical life is intrinsically temporal. A human lifespan is only temporary and was so intended from the time of Adam. Whether it be 969 years, seven decades, three months or one day, each physical life will eventually come to an end. The human body was designed to die. It may come by accident; it may be by disease; or perhaps the body will just wear out. But the statistics for it have never dropped below 100 percent. God could, of course, preserve physical existence to eternity, but He has not chosen to do so. We know of no case where He has maintained physical life indefinitely, even for the patriarchs and prophets. Yet God has many times chosen to extend physical life temporarily by healing a disease or repairing an injury. God has healed; He does heal; He will continue to heal as long as there is physical life extant. But the reasons for doing so are always temporal. 2. Spiritual life is the hope of the Christian. Once this physical life ends, healing ceases to be a concern, since the body of the resurrection shall be a spiritual one. Healing, therefore, pertains to this life alone and is a short-term, although important concern. One should never forget that the real hope of all true Christiansboth for the healthy and for the sickis eternal spiritual life through the resurrection and not prolonged physical life through healing. Furthermore, one's ultimate reward is neither determined nor affected by whether he was or was not healed during his physical lifetime. The fact that we can know by the written record of God's Word that Jesus Christ performed the most amazing and incredible healings during His ministry, and that those healings manifested God's power through Him, should give us great confidence. It is through our faith in the reality of Jesus' healings that we can be assured that, through this same power, God has promised to forgive us of our sins, cleanse our minds and, ultimately, to resurrect our bodies from the dead. 3. Healing is not an indicator of righteousness; nor is it a test of spirituality. Even the most righteous and most spiritual eventually die of something physical. Healing is an example of God's mercy, a product of God's wisdom. When He chooses to intervene and heal, we should be grateful. When He does not, we should not necessarily assume lack of faith, unrighteousness, and/or insufficient spirituality. And when we die, "blessed are the dead who die in the Lord" (Rev. 14:13). Therefore, neither healing nor the lack of it are an indication of one's level of faith or spirituality. In Acts 3:1-8, God healed, through Peter and John, a man who had no idea that he was about to be healed; he desired money, and was totally shocked at being healed. Surely the healing of this man was not at all indicative of his righteousness or spirituality. God sometimes heals the new convert and the spiritually immature, while he may withhold it from the mature Christian. And we shall all, no matter how spiritual, eventually die of some physical state which God does not correct and heal. Another situation where healing was not an indicator of righteousness or a test of spirituality was the example of the apostle Paul mentioned earlier. If his thorn in the flesh was physical, he was not healed of this serious affliction. 4. Faith is not the sole criterion for determining whether a person shall be healed. One main prerequisite God requires for healing is the total confidence and faith that God does indeed exist and can heal us of our illnesses (Matthew 9:28-29). One must not forget that the people whom Jesus healed during His earthly ministry had, for the most part, already heard numerous accounts from far and wide of His miraculous intervention in other people's lives to heal them. It would not, therefore, have required that much effort on their part to believe that Christ couldand, indeed, wouldheal them. This means that those whom Jesus healed by no means had to have been spiritual giants possessing great faithquite possibly it was just the opposite. As Jesus Himself said in another context, "Blessed are those who have not seen and yet believe" (John 20:29). God is intensely concerned with an individual's mind and heartattitudes that are always obvious to God though often not apparent to others. In the matter of healing, it may be one's attitude as much as one's faith that may influence what God will do. "But this is the man to whom I will look, he that is humble and contrite in spirit, and trembles at my, word" (Is. 66:2). Anyone who seeks to be healed to show others his righteousness or favor with God, or who desires vindication of his position, or who craves recognition of his spirituality will be sadly and sorrowful, disappointed. The New Testament refers to "gifts of healing" (1 Cor. 12:9,30) which apparently differed from the normal function of elders anointing the sick. Only a few had this unusual gift of healing; it was not the possession of everyone. In the Church today, we see no evidence of such a gift having been bestowed on any individual, certainly not as a permanent thing. Perhaps God will give this gift in the future, but He has not done so yet. Since the Church recognizes these individual circumstances, it vigorously teaches that there is no way of knowing in advance whether any person will be supernaturally healed. Similarly, the Church teaches with equal vigor that its ministry must not attempt to influence the person in any way regarding what type of action he may wish to take for his health other than to recommend that each person seek the most professionally competent specialists available for consultation or procedure. Certainly we can go to medical sources and take advantage of the scientific advances they have to offer, with the full confidence that this positive act on our part in no way interferes with God's ability to heal supernaturally should that prove to be His will. 5. The relationship between healing and faith is complex, necessitating an understanding of the whole Bible and current, practical experience. The numerous healings of Jesus Christ show the clear, active involvement of the faith of the individual (Matthew 9:22; Mark 9:23; Luke 8:48-50). Yet, the man healed in Acts 3 obviously had no faith whatsoever, despite which he was completely healed. Likewise, the slave of the centurion was healed because of the centurion's faiththe slave himself probably did not even realize why he suddenly got better (Matthew 8:5-13). The Bible shows that there are different "kinds" of faith, or at least different levels of faith. There is a faith which all Christians are required to have for salvation, but this is not necessarily the same kind of faith needed for healing. Jesus said that if we had enough faith we could literally move mountains (Matthew 17:20). Yet no living Christian that we know of has had such faith. It is impossible to "work up" such faith; in the same way, it is impossible to "work up" the faith involved in healing. Only God can supply this faith. It is His responsibility and, consequently, an actual healing or the lack of such a healing must never be viewed as a straightforward indication of an individual's righteousness, spirituality or favor with God. On the other hand, it is our responsibility to yield to God and His Spirit so that we may grow in this God-given faith. We should beseech God to do what the apostles asked of Jesus in Luke 17:5, "Increase our faith." The faith that Jesus said was involved in healing seems so simple, yet so difficult, and yet so simple again. Faith is the belief that God shall heal. But our years of experience in the Church, going through our own trials and empathizing with the trials of others, sometimes add enormous complexities to faith. Knowledge itselfand all human knowledge is partialcan sometimes militate against faith. Faith cannot be faked, and with the many demands and multifarious distractions impacting the Christian, faith may just not be there. The examples of faith in the New Testament seem so simplealmost too simpleto us. These people did not have time to develop the faith we think is necessarythey hardly knew Jesus or the apostles, and certainly had little idea what they taughtthey just immediately believed and were healed. Maybe there is a lesson here. 6. The lack of faith is not sin, nor is the lack of healing a sin; healing is rather a special benefit from God, which is neither commanded nor required. Healing is a special benefit from Goda gift from our Father in heaven through Jesus Christ. But healing is not a part of God's spiritual-moral law, and as such is neither commanded nor required by God. Consequently, it cannot be a sin if one is not healed. The fact that one person decides to seek anointing for the healing of a physical condition while another suffering from the same condition, does not, can in no way be taken to mean that the first person is necessarily righteous or that the second person is necessarily unrighteous. It is just that the individual who asks for anointing is seeking this special benefit from God. We all, in some manner, lack faith. This is no more an indictment than to say that we are all human. How many have the faith to move mountains? Yet no Christian feels spiritually inferior because he cannot do so. The same lack of spiritual inferiority should equally apply to the faith required for healing. How many have consistent faith? On the other hand, to say that a person lacks faith is not necessarily to blame him in any way, since faith comes from God. If that individual does not have faith, it may be because God has not given it to him. Can one blame God for not having given someone something that only He can give? Of course, this does not mean that the individual does not have a responsibility; yet the faith required for healing must come as a gift. There is sometimes the misconception that if something did not happen as hoped, it was due to lack of faith. As a blanket assumption, this is untrue. What is faith? It is total belief. But even absolute belief in something contrary to God's intention will not bring it about. God may honor faith or belief in something not contrary to His will. Conversely, He will not honor a request contrary to His will, no matter how much faith the requester has (for example, the death of David's and Bathsheba's first child). Jesus Christour perfect example of faithrequested that the cup of His suffering and death be taken from Him. It was not removednot because of a lack of faith, but because God had ordained otherwise. A person can have "absolute faith" when he asks for healing and still be denied it, because God in His wisdom may think it is better for that person not to be healed. Healing is not just a matter of faithit is also a matter of mercy. God said, "I will have mercy on whom I have mercy, and I will have compassion on whom I have compassion" (Rom. 9:15, citing Ex. 33:19). Healing is an extension of God's mercy; it is not an absolute promise according to one's faith. Faith usually doesbut does not forcibly have tohave something to do with it. There is no better example of a spirit-filled Christian with great faith in God than the apostle Paul. Yet he had a "thorn in the flesh" which he was apparently never healed of (2 Cor. 12:7-10). Was the reason for his not being healed any sin on Paul's part? Was there any sin involved at all? Was his physical infirmity itself the result of sin? Was Paul's failure to be healed a sin in itself? Was it symptomatic of a lack of faith which was a sin? We can pretty well answer all of these questions in the negative and be quite confident of this conclusion, not because Paul did not sin, but because he was so open and honest in freely admitting his most personal sins. Paul was so hard on himself in Roman's 7, where he exposed his own sin of covetousness and his other human frailties, that we can rest assured that if there had been even a possibility that sin was in any manner connected with his physical infirmityif some sin on his part might have been the cause of it, or if the lack of healing might have been a sin, or if he might have lacked faithPaul would surely not have hesitated to fully disclose it. The only possible reason Paul did not discuss sin in the context of his own physical infirmity was that sin was not involved at all. Paul's attitude to his failure to be healed is truly exemplary. There is no question that Paul did not lack faith; faith had no relationship whatsoever to the fact that he was not healed. God simply knew what was best for him. Paul needed this infirmity to keep him "from being too elated by the abundance of revelations" (v.7) given to him (such as being "caught up to the third heaven . . . into Paradise . . . and hearing things that cannot be told, which man may not utter," vv.2-4). Paul accepted God's decision that, "My grace is sufficient for you, for my power is made perfect in weakness" (v.9), with magnificent humility and a fiercely loyal desire to now fully appreciate his physical weakness, which God knew was important for his spiritual strength: "I will all the more gladly boast of my weakness, that the power of Christ may rest upon me" (v.9). There can be no better example to followno better attitude to havewhenever God, for reasons only He knows, decides to withhold His blessing of healing. What God knew was best for Paul, He may also know to be the best for many other Christiansthat our continuing physical weaknesses are efficacious in continuously building our spiritual strength. 7. Faith must not be confused with desires, fears or pressures. A person's faitheven one's own faithis difficult if not impossible to assess. It is in no way "godly" or "spiritual" for a person to overestimate his own faith, then make drastic decisions based upon this misjudgment. "Hoping" or "wishing" to be healed is not the same thing as having the special faith that God must give to really be healed. Neglect is not faith, neither is fear of doctors and hospitals. It is naturalalthough surely not wisefor humans to delay undergoing even a medical diagnosis to determine the cause, nature or extent of an illness because of fear of what they might learn. Some even confuse this fear of diagnosisthe unwillingness to face the reality of their conditionwith faith. Fear and faith are not equal; they are in fact opposites. For some it is a fear of the unknown; for others it is a fear that if they find out something frightening they will not have the faith to face it. But to act based on fear, and convince oneself that it is based on faith, is brutal self-deception which can yield no good result either physically or spiritually. Similarly, it is strangely simple to confuse faith with stubbornness or pride. Peer pressure can also loom as a powerful force, imposing itself as a surrogate for faith, inhibiting the individual from doing what should be done. Likewise, for some to suffer rather than seek relief can fulfill certain psychological needs. Having a martyr-complexenjoying watching others watching you languishis far from the simple faith of those Christ healed. Dying in stubbornness or pride, continuing to suffer in order to uphold one's own self-righteousness or self-image is just another manifestation of human nature. Thus, it is possible for a person to neglect medical help because of subconscious factors or vanity, while convincing himself (and/or trying to convince others) that it is because of faith and spirituality. A Christian must walk in continual faith. This faith is demonstrated in many ways. If God allows a person to die, this may be a demonstration of faith. But, if one can live many long and useful years in God's service through an operation, rather than be debilitated by disease or even die in agony, that cannot be condemned as a lack of faith. To refuse the operation may be only fear, peer pressure, neglect or ignorancenot faith. It is likely that God would heal more people, if more people had more faith to be healed. One of the biggest factors that blocks a person from receiving more faith is his own erroneous belief that he already has enough faith when he does not. As previously stated, it is not enough to "think" or "hope" that one has the proper faith, or to wish" that he had it. One reason people are not healed is because they do not have the appropriate faith. This does not mean they should pretend to have this faith. That would be disastrous. For a person not to acknowledge his lack of faith in this area would be folly indeed. God will not heal a person because that person thinks he has faith if he in reality does not. (God may heal him in spite of that fact.) For God to heal people without faithbut who think they have itwould serve to perpetuate their self-deception. Perhaps this is one reason why God does not heal more often. Since God will not give someone something he does not want (i.e. the faith that the person thinks he already has) each must appraise his own faith realistically. But a Christian who is realistic enough to soberly assess his own faith and find it wanting is not a "weak" Christian. He may in fact be quite a strong Christian, who is converted enough to see himself as he really is; such an individual will not bow to stubbornness or yield to pride when his need of external help highlights his physical debilities and spiritual imperfections. 8. Healing and faith are totally private matters between a person and God. Anointing for sickness is a solemn ceremony. It is an expression of the faith of Jesus Christ and an affirmation of our faith in Himthe recognition of God's sovereignty over our life and well being. It is thus a very personal thing between the individual and God, similar to prayer, though the minister is an important part of the process. No one should take upon himself the role of spiritual judge or "second guesser" over another's actions in this regard. To do so is to usurp that person's God-given right of free moral agency. Therefore, any reasonable request for anointing should be honored, regardless of the nature of the illness or affliction and regardless of whether the person is consulting a physician or of what treatment he may be undergoing. On the other hand, some people's requests for anointing border on superstition. To anoint for every sniffle or mild ache makes a mockery of divine healing and Christ's suffering. There is an extremely important caution here, however. A minister cannot put himself in the position of a medical diagnostician and refuse to anoint because he regards the persons illness as "minor" or "not life-threatening," What at first may appear to be the most insignificant symptoms can later turn out to have been the early manifestations of a serious illness. More than one person has died of pneumonia which started out as a cold, or of cancer of the colon which in its earlier stages seemed only a minor digestive imbalance. Hence, although the minister himself should preach publicly about the solemnity of anointing and about taking Christ's sacrifice seriously, he should nonetheless respect the judgment of the sick person who feels that he needs anointing. 9. It is neither possible nor profitable to determine why God has or has not healed an individual. One can seldom say with certainty why a person has or has not been healed. To conclude that one person was healed because of his spiritual uprightness is no more accurate than to conclude that another person was not healed because of his spiritual inadequacy. The Biblical example of Paul and others simply negates such reasoning and renders any such exercise fruitless. Healing may relate to any number of factorsthe person himself, his immediate family, his close friends, his wider acquaintances, the minister involved, the timing, the circumstances, etc.and it is pointless to try to discern why something did or did not happen with respect to healing. The additional uncertainty of not knowing what "the gifts of healing" (1 Cor. 12:9) were and how they workedand how they may apply todayadds further complexity to our understanding of the application of healing. Since all must eventually die, it is inevitable that many will suffer from incurable diseases. If the best physical knowledge cannot heal and God chooses not to intervene, then "blessed are the dead who die in the Lord." If that is the way God allows one to serve, so be it. Perhaps, ultimately, that is the real test of faithto die confidently in Christ, entrusting to Him the life He gave to do with as He sees fit. Death may in some cases be a greater sign of faith than life and healing. Nevertheless, one should not prejudge his own case by assuming this to be true and neglecting to seek proper medical aid as a consequence. If God's will is for a person to die, it should be in spite of his best efforts to recover and not because of his stubbornness in avoiding professional aid. God chooses who His martyrs will be: we cannot and must not make this decision for ourselves. It is both offensive and inaccurate to say that one who is not supernaturally healed (or who seeks medical aid) is a "Weak" Christian. He may have weak faith (as compared to the amount of faith necessary to be healed, but surely not as compared to the faith of other Christians who may never have been tested in a life-or-death situation), but that does not mean that he is a weak Christian. He may be far more spiritually mature than most in the congregation. Indeed, God may not be healing him because he can take ithe has enough spiritual maturity to endure the trial. In the final analysis, faith is only one aspect of the Christian life, and it is not even the greatest; this honor is reserved for love (1 Cor. 13:13). "If I have all faith, so as to remove mountains, but have not love, I am nothing" (v.2). Conversely, a person who is weak in faith but strong in love is a far greater Christian in God's sight. 10. It is entirely within biblical principles and common sense to seek competent medical help and still rely on God for healing at the same time; healing through faith in God and the modern health sciences is not a contradiction or a combination of opposites; indeed, what God can do for man as a special blessing should work together with what man can do technologically for himself. God has healed; God does heal, God shall heal. There are no limitations on God's ability to heal any and all sickness and bodily defectssupernaturally, miraculously, completely. But does this mean that a Christian has no responsibility to help himself if he becomes ill or injured, other than to trust in God for healing? Biblical examples and common sense teach us that God is practical and logical, and He expects human beings to do what they can to help themselves. Just as little children depend on their parents, we as Christians must depend on God for certain things. But God also expects us to grow and mature. If we can stand on our own feet, we should. If we can do something for ourselves, we are derelict in our responsibility if we do not. God's Church has taught this for years. If a person has a badly decayed tooth, he should have it repaired or removed. This in no way usurps Gods power of divine healing. If one has a headache, he can take an aspirin. If one has a broken bone or an open wound, he should have it set or sewn as the case may be. These are physical measures which can and should be made use of. They are not an affront to God as our Healer; nor do they contradict faith. In fact, to ask God to supernaturally do for us what we can naturally do for ourselves may begin to undermine the vital representational analogy between healing and the forgiveness of sin, conversion and the resurrection from the dead (since no human being can ever do any part of the latter). In Matthew 4:5-7, it was Satan who tempted Jesus by setting Him on the pinnacle of the Temple and challenging Him to throw Himself down so that God would save him. Jesus' answer was that "You shall not tempt the Lord your God" (v.7). What is tempting God? Is it trying to entice God into a position where He "must" do something "good" to "save" us? If so, could we ever, however sincerely, be putting ourselves into a position of tempting God, however inadvertently, by asking Him to do for us what we can and should do for ourselves? Only God can "heal"if we define "healing" as a miraculous, supernatural removal of an affliction or illness. Physicians are only mortal men and can only work with the laws God designed to function in the human body. Medical science can work to speed, enhance or aid recovery. As such, the roles of God and man do not conflict; in fact, they can complement each other. In the same manner that healing is not a test of righteousness, so also going or not going to a physician is not a test of righteousness. Neither does it show a lack of faith in God's ability to heal nor does it prevent God from performing a miracle. Faith in God and scientific confidence in man are not in conflict. Faith in God is a matter of the heart between a person and God. It is entirely possible to receive medical helpand even have a positive trust in that technological helpwithout having this trust or confidence supersede or negate one's faith in God. It is, of course, possible to have no faith in God and an almost superstitious faith in man's scientific knowledge. But, in either case, the technical utilization of modern medical science is not the factor that must decide where one's faith is. Faith is fully determined by the person's attitude in his private relationship with God. Luke 8:43-48 records the story of "a woman having an issue of blood twelve years, which had spent all her living upon physicians, neither could be healed of any. Note that Jesus in no way unbraided the woman for having gone to the physicians. Furthermore, and even more relevantly, He did not withhold healing from her because of iteven though, as it appears, she came to Him as a last resort. Indeed, Jesus said she did have the faith to be healed (v.48). Thus, this verse serves as an example of one who had gone constantly to physicians and yet did have faith to be healed. Certainly one could not immediately conclude she was weak in faith because she had used the medical services of her time. There is no reason why the judicious use of physical methods should interfere with either one's faith or the ability and desire of God to heal. Faith says that God can heal; it is not a guarantee that God shall heal in every individual situation. It is surely not a sign of faith to neglect appropriate physical methods which can cure a disease, slow an illness or relieve suffering. It is also not a sign of faith to seek obscure second-class treatment when competent first-class health care is readily available. The scientific and technological progress of the health sciences has been remarkable, especially over the last few decades, with increasing sophistication and effectiveness of technique, combined with a decreasing incidence of complications and side effects. For such achievements man should give God the credit; for it was God who created the human mind, empowering it with the creative brilliance to constantly attain to new heights of achievement in the physical world. The Church is not in the health business. Consequently, it is not the Church's responsibility to endorse or condemn any particular treatment or procedure. Each individual has the same responsibility to examine alternative proposals, and seek and evaluate advice from several professional sources before making a decision in a serious health matter. Faith is demonstrated in various ways. If one can live many long and useful years in God's service through an operation, rather than wasting those years by suffering in agony, how can that be condemned as lack of faith? To have the operation may evidence greater commitment to God, because one believes in the importance of service to His Church. To refuse the operation may only be the unintended neglect of one's Christian responsibility to God and His Work. James wrote that "faith without works is dead." This applies to all aspects of the Christian life including health maintenance, health care, disease prevention, regular checkups by a qualified doctor, and healing and/or medical procedures in times of illness or injury. One should always consider the long-range implications for oneself and one's family in these areas by seeking experienced professional counsel and by making wise, sound-minded decisions. Christians should avail themselves of the best health care that man can provide and, at the same time, ask God to supernaturally supply what man cannot. This could also include the sick person asking God to bless the skill of the doctor in his diagnosis and treatment (much as God inspired the craftsmen who built the ark of the covenant and the Tabernacle, and, later, the Temple, see Ex. 31:3ff; 35:31, 36:1-2, 1 Kings 7:14). Faith in God for healing and the sensible, sagacious use of the most modern medical/health procedures do not clash. They can, indeed, work together in harmony. The human personality is a unified whole composed of physical, mental and spiritual elements, and each one must be functioning as effectively as possible for the whole person to be completely healthy. In recent years, as a matter of interest, there has been increasing recognition among large segments of the medical profession that they should focus their attention as much on the maintenance of good health and the prevention of disease as they have on the treatment of disease. One reflection of this is the increasing employment of the term "health sciences" instead of "medical science." Another reflection of this trend is that many doctors have come to appreciate that spiritual factors, especially faith and prayer, can play a significant role in the recovery of patients. Christians should appreciate both the special blessings of healing that God offers to them and the sophisticated techniques that man has developed to diagnose and cure illness. Healing through faith in God and through scientific medicine should, therefore, never be artificially opposed to one another, but should, rather, symbiotically reinforce one another to bring the greatest benefits to human beings. 11. Physical procedures cannot be evaluated based on spiritual criteria; all routine maintenance, as well as special treatment for illness or injury should be the most effective and finest available. It is the responsibility of each Christian to recognize the important distinction between the physical and the spiritual. God's miraculous intervention to heal is spiritual; this healing is God's prerogative. What we do for ourselves is physical, a means of aiding and complementing the natural bodily processes in healing the body. God does expect us to do what we can for ourselves. No physical procedure is intrinsically more righteous or spiritual than any other, though one may well be more effective and have fewer side effects than another. Surgical interventions, pharmacological prescriptions and other medical procedures (whether diagnostic, preventive or curative) must be evaluated on their own merits and on their own terms. There should be no hair-splitting between different physical treatments as far as their spirituality is concerned Such would be contrary to the implications of the Bible, the teachings of the Church, logic and plain common sense. One physical method is not more godly than another; one physical method is not necessarily more in harmony with the Bible than another. Physical healingof any and every sortmust be distinguished from divine, miraculous, supernatural healing. Stitching together an open gash in one's arm is just as physical as open-heart surgery to stitch together a hole between one's ventriclesboth involve human intervention to aid the body's normal regenerative processes in restoring the cellular tissue. Special diets and supplements to fight cancer are just as physical as surgery, radiation and chemotherapy. To have a broken bone set is physical; to take an aspirin is physical; to fast for health reasons is physical. Mega-vitamins, rosehip tea, laetrile, wine and oil are all just as physicaland just as non-spiritualas penicillin, vaccinations, cataract removal and appendectomies. To extract a seriously decayed tooth does not differ in kind from excising a malignant tumor or a diseased appendixboth involve professional competence to remove a damaged part of the body before its continued deterioration causes worse complications, such as the spreading of infection, The efficacy of different physical treatments is evaluated by their results, not by their degree of spirituality. One may be physically preferableone drug may be more beneficial with fewer side effects than anotherbut one is surely not spiritually better in God's sight. Therefore, a person chooses to do something physical about a bodily condition, his concern should not be about which method is more spiritual. Rather, his sole concern should be to find out what is the best method with the fewest side effects. In evaluating physical procedures in matters of health, the Christian is encouraged to emphasize proper health maintenance and disease prevention: there is minimum expense, little inconvenience and no side effects to a balanced program of health care. The appropriate use of nutrition, for example, should always be part of a health-maintenance and disease-prevention program. Eating natural foods (as much as logically possible) in a balanced diet and avoiding processed sugars and starches, are both much easier and more enjoyable to do than later being forced to undergo medical treatment. Proper health care should include periodic physical examinations for all Christians and their families by a qualified medical doctor. Care should be taken to select the most able and proficient doctor available as the family physician. He should have a genuine interest and concern about the health of all members of the family. Eminently qualified specialists for particular problems should generally be recommended by the family doctor. When one seeks professional medical help, he should select the most competent within his means. There are different specialties and different degrees of competency among individual practitioners just as in any other profession. One is not more "righteous" than another, but one might be more skilled than another. All this will also help people avoid falling prey to quackery and faddism. If a person recognizes that the best scientific knowledge should be sought, and that this is not a sign of a lack of faith, he will naturally want the best that he can afford for himself and his family. He will be sound-minded in matters of health, not seeking physically "miraculous" or unorthodox "cures " under the false assumption that they are somehow more righteous than the procedures of a knowledgeable specialist, and he will save both his money and his health in the process. 12. Christians must never judge one another, nor compare themselves among themselves; Christians should rather encourage one another, mutually bearing their burdens. Far worse than any personal spiritual slips or lapses in faith is the commonplace gossip of judging fellow members of the congregation. Such innuendo and rumor is vicious and terribly debilitating to Christian character. Paul admonished the Roman Church, "let us no more pass judgment on one another, but rather decide never to put a stumbling block or hindrance in the way of a brother" (Rom. 14:13). In writing to the Corinthian Church, Paul sternly rebuked them for their attitude of making internal comparisons: when they measure themselves by one another, and compare themselves with one another, they are without understanding" (2 Cor. 10:12). Surely these principles apply to all facets of Christian life, but never with more direct impact than in matters of health and healing. It is carnal, but nonetheless common, for many individuals to consider their own particular approach to physical health and healing as the best or the most spiritual. All too often their desire to share this "special" knowledge with brethren ends up in any thing from a campaign to a crusade. While the laws of the land and the principles of God's Church give to everyone the full freedom to make their own decisions in such deeply personal matters, basic human decency and comity [atmosphere of social harmony] dictate that one should never try to impose his will on others. Brethren should be more than willing to help each other by exchanging ideas and information in matters of health and healing. But extreme care should be taken not to allow such conversation to subtly degenerate into even mild coercion through deep pressure. A person should be as respectful of another person's approach as he would want that other person to be of his (Lev. 19:18; Matthew 19:19; 22:39; Luke 10:27). The worst thing we can do as Christians is to offend our brothers in any way, especially "little ones" or those who are weak in the faith (Matthew 18:6; Rom. 14). On the other hand, to encourage and strengthen our brothers and sisters in the Church, bearing one another's burdens willingly and cheerfully, is the essence of true Christianity. What is the minister's role in matters of health and healing? A minister of God is a professional in spiritual understanding; he should be ready to fully explain the purpose of healingwhat it is and what it representsto all who desire to know. Furthermore, the minister is the expert in counseling his people and serving his congregation. But he is not necessarily, by virtue of ordination, a medical or nutritional expert. Consequently, he should faithfully teach what the Bible says about health and healing, and he should also encourage his people to seek the best professional advice available when needed. The minister must be truly neutral on medical matters. Subtle differences can be dangerous. He cannot tell one person that he "should" take vitamins, get his broken bone set or have a decayed tooth extracted, if he will then tell another person that, "It's up to you," whether to take antibiotic drugs, get an internal injury repaired or have a diseased appendix removed, The phrase, "It is not wrong," can also convey a negative implication, suggesting, in effect, that, "Although it is not wrong, it is spiritually not the best." Such would subtly assign fallacious levels of righteousness to physical procedures when all are in fact the same in God's sight. The minister is the spiritual leader of his congregation and must take great care not to abuse this position of spiritual power, trust and respect. He must be as aware of his physical limitations as he is of his spiritual responsibilities. The minister must operate on the highest plateau; his realm is the spiritual and this is where he must give his counsel and advice. Along these lines, one of his more important duties is to be sure that members of his church are not judging each other and are not comparing themselves among themselves with respect to health procedures and healing. He can accomplish this most effectively by emphasizing God's positive instructions on these matters and following up His teachings with encouragement and exhortation. God can and does heal in ways and manners and at times and for reasons that He determines for Himself. As such, divine healing is totally beyond the scope of medical science; therefore, doing what we can in seeking and utilizing the most competent, professional assistance in times of illness or injury will not inhibit God from healing us, but can contribute to the efficacious restoration of full health. Divine healing is a miraculous intervention by the creator of the universe in our lives; it is a special blessing from God given according to His mercy and our faith, and represents God's power through Jesus Christ to forgive our sins, cleanse our minds and, ultimately, establish the Kingdom of God on earth and resurrect our bodies from the dead.